Prints from Saltgrass, a Utah Arts Council Traveling Exhibit Program, will be displayed at College of Eastern Utah’s Gallery East in the old Student Activity Center from November 7 through December 9. Saltgrass Printmakers is a non-profit printmaking studio and gallery in Salt Lake City. Founded in 2003, their mission is to advance, promote, and support printmaking as a fine art medium in Utah. Printmaking is a term that encompasses a number of fine-art techniques that generally involve making images by pressing ink into paper. Specific printmaking techniques include intaglio (etching, drypoint), relief (woodcut, linoleum cut), collagraph (combining both intaglio and relief), letter-press (relief printing that includes text), solar plate (photo polymer printing plates) and screenprinting as they are used to make fine-art original prints. The studio at Saltgrass Printmakers is an open-access facility available to all area artists. The only criterion for membership is that you know how to safely use the equipment in the shop. The show that the UAC created for the Traveling Exhibition Program consists of prints by the 10-artist members of the Saltgrass studio as of Spring 2008. 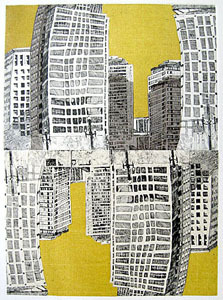 Each artist works in a variety of printmaking techniques and media. Working in a community studio such as Saltgrass fosters a sharing and exchange of ideas, techniques and information that can lead to interesting collaborations. In this particular show we are highlighting the variety of techniques and resulting prints that have been created and printed at Saltgrass Printmakers. The Traveling Exhibition Program is a statewide outreach program of the UAC. The program provides schools, museums, libraries, and community galleries throughout the state with a variety of exhibitions. The Utah Arts Council works to make the arts available to everyone, regardless of special needs or cultural differences. This program is supported in part by a grant from the National Endowment for the Arts Washington D.C. and programming funds from the UAC. Gallery East is open weekdays from 9 a.m. to 5 p.m. Exhibits are always free and open to the public.